LOS ANGELES – Listen, it was not business as usual at the Grammy Awards – music’s biggest night – on Sunday (Feb 10). As the 61st annual ceremony arrived at the Staples Centre, the event had been under pressure to remain relevant in a rapidly evolving music scene, and meet demands for more equitable gender and genre representation. Last year, just one woman accepted a solo award during the broadcast, for example, while rappers had previously endured lean pickings at the show, despite rap’s dominance as the biggest music genre in the United States. 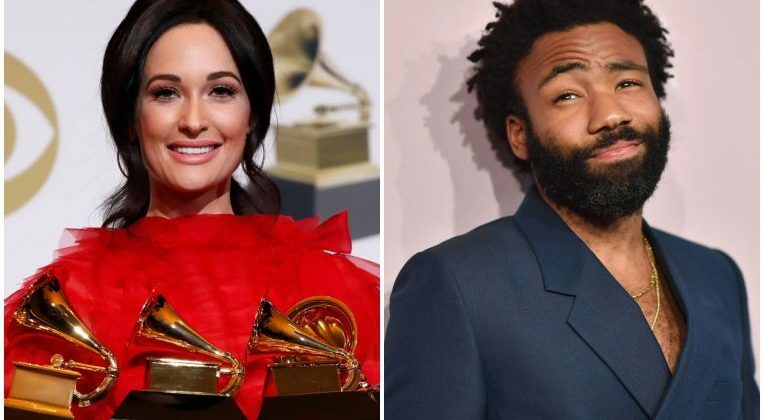 Not this time round as country artist Kacey Musgraves won album of the year for Golden Hour while This Is America by Childish Gambino claimed both record and song of the year in a breakthrough for rap. British pop singer Dua Lipa was named best new artist – in a field heavy with female talent – and popular rapper Cardi B took best rap album for Invasion Of Privacy. This year, women were well represented among the nominees. Lady Gaga, Cardi B, Maren Morris and Musgraves were all competing in the most important categories, facing artists including Drake, Kendrick Lamar, Post Malone and Childish Gambino. Childish Gambino won four awards in all on Sunday but was not present at the ceremony. But Drake, who had been expected to stay away, turned up to collect the Grammy for best rap song for God’s Plan. Drake, the biggest streaming artist of 2018, told musicians not to worry about winning prizes. “This is a business where sometimes it’s up to a bunch of people who might not understand what a mixed-race kid from Canada has to say or a fly Spanish girl from New York, or a brother from Houston,” he said. “The point is, you’ve already won if you have people who are singing your songs word for word, if you’re a hero in your home town,” he noted in his acceptance speech. Female empowerment was a key note on Sunday, with the show kicking off with a high-energy performance by rising star Camila Cabello. After a brief monologue by host Alicia Keys, she was joined on stage by Jada Pinkett Smith, Lady Gaga, Jennifer Lopez and Mrs Michelle Obama. They celebrated the power of music – and women. “From the Motown records I wore out on the (Chicago) Southside to the Who Run The World songs that fuelled me through this last decade, music has always helped me tell my story,” Mrs Obama told the cheering celebrity audience in Los Angeles. “Music shows us that all of it matters – every story within every voice, every note within every song. Is that right ladies?” she said as many in the crowd remained standing. The women on stage with Mrs Obama spoke about how music gave them a space to explore who they are. “They said I was weird, that my look, my choices, my sound, that it wouldn’t work,” Lady Gaga said. All but about nine of the 84 awards were given out in a non-televised ceremony. Brandi Carlile led the pre-show portion with three wins in the American roots category. Lady Gaga and Musgraves each had two. Lady Gaga’s Joanne (Where Do You Think You’re Goin’? ), a piano version of a song first released more than two years ago, took best pop solo performance, and Shallow, from the film A Star Is Born, took best song written for visual media. Musgrave’s Butterflies won best country solo performance and Space Cowboy took best country song. The pre-show awards may be invisible to most of the general public but they can set important benchmarks in the industry, and have the power to reshape careers among artists in genres far beyond pop radio. One barrier was broken with the award for best engineered album, non-classical, which went to Beck’s Colours. Among its winners was Emily Lazar, who became the first woman to win as mastering engineer in that category. With only nine prizes given out during the show, the rest of the time was taken up by performances – nearly 20 of them. At the Grammys, the job of host has typically been a small one but Keys’ involvement carried symbolic weight.